As soldiers prepare to honour eight comrades killed in Afghanistan last week, Foreign Secretary David Miliband denies accusations that British troops are poorly equipped. The foreign secretary, David Miliband, has strongly denied accusations that Britain's mission in Afghanistan is poorly equipped, and insisted the operation would "make us safer here." The Conservatives have accused the government of "the ultimate dereliction of duty" in not providing troops with enough equipment - particularly helicopters. They are due to put questions to the Defence Secretary Bob Ainsworth in parliament this afternoon. Soldiers in Afghanistan will hold their own private memorial today to the eight soldiers killed at the end of last week. The latest deaths brought the total number of British military fatalities in Afghanistan since the start of operations in 2001 to 184 - surpassing the 179 who died in Iraq. The deaths sparked fresh criticisms that the soldiers lacked the necessary numbers and equipment for their mission, as well as renewed questions about the whole purpose of the UK presence in Afghanistan. The Stop the War Coalition will stage a demonstration outside Downing Street today, demanding that the troops are brought home. Prime Minister Gordon Brown defended the offensive and insisted that despite the losses of recent days Britain was gaining in the fight against the Taliban. As he tried to rally public support for the campaign the prime minister described the mission as a "patriotic duty" to keep the streets of Britain safe from the threat of terrorist attack. He paid tribute to the "sacrifice" of the 15 troops who had died since the start of the month in the bloodiest fighting the army had seen in the current campaign. In an interview with the British Forces Broadcasting Service, the prime minister insisted that more armoured vehicles - including the heavily-armoured Mastiffs and the new Ridgebacks - were being deployed with better protection against the roadside bombs which have claimed so many lives. But Tory leader David Cameron said it was a "scandal" that British commanders still lacked sufficient helicopters to enable their troops to move around Helmand with a degree of safety. The Ministry of Defence named six more of the dead - including five members of 2nd Battalion The Rifles who were killed on Friday during a foot patrol near the town of Sangin in central Helmand. They were Corporal Jonathan Horne, 28, Rifleman Daniel Simpson, 20, and three 18-year-olds: Rifleman William Aldridge, Rifleman James Backhouse, and Rifleman Joseph Murphy. Also named was Corporal Lee Scott, 26, of the 2nd Royal Tank Regiment who died in an explosion near Nad-e-Ali in Helmand on the same day. Two soldiers killed on Thursday were named as Rifleman Daniel Hume, 22, of 4th Battalion The Rifles, and Private John Brackpool, 27, of Prince of Wales' Company, 1st Battalion Welsh Guards. 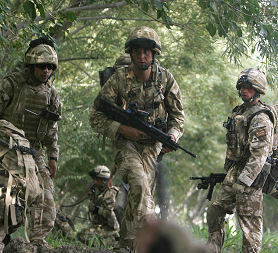 The hidden cost of Britain's Afghan war?